Kickboxing success: Corey O Malley (Galway), Martin Ward (Athlone), Peter Sheppard ( Galway), Sean Ryan (Mayo), Joe McCormack (Galway, assistant coach), Whitney Sheppard (Galway), Pete Foley (Black Dragon chief coach and Irish team manager), Shane Lawless (Athlone), Damien Creavin (Galway), Cian McCormack (Kinvara), James Kelly (Galway), and Alex Fitzpatrick (Tuam). 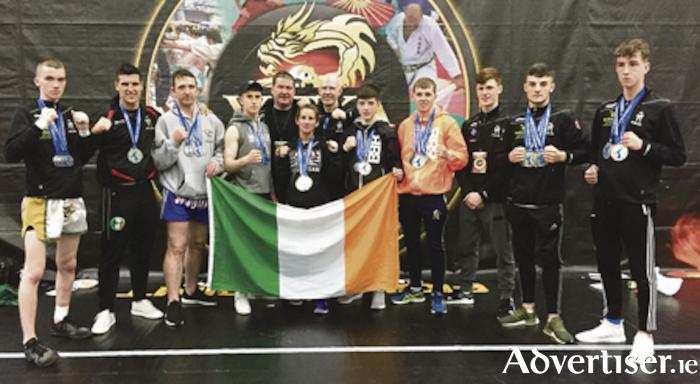 Part of the IKF Ireland kickboxing team which produced 37 podium finishes, the Galwegians returned from the Unified World Martial Arts/Kickboxing Championships with a haul of gold, silver and bronze medals. It proved an eventful competition for the group which was forced to evacuate the premises after a suspected terrorist turned out to be an unknown weapons training involving shooting blanks. Unfortunately top seed Cian McCormack from Kinvara, who won gold in 2015 and 2016, injured himself running from the scene in bare feet and was unable to compete in his two finals. However 18-years-old Galway Black Dragon fighter James Kelly from Athenry knocked out an Italian in the second round of the cadet 67kg kickboxing final, and also stopped a fighter from Iran in the first round of the final of the cadet 71kg K-1 division. Alex Fitzpatrick (15 ) from Tuam also won gold in the junior kickboxing and K-1 division, taking out opponents from Italy, Czech Republic and Ukraine on the way, while Damien Creavin from Galway city took gold in the men’s 60kg kickboxing division. Whitney Sheppard defeated fighters from Italy, France and Germany to secure gold in the senior women's K-1 division. Sean Ryan from Cong won silver medals in kickboxing and K-1; Peter Sheppard from Galway won silver and bronze in Kickboxing and K-1; Damien Creavin also won bronze; and Corey O'Malley won silver and bronze in Kickboxing and K-1.